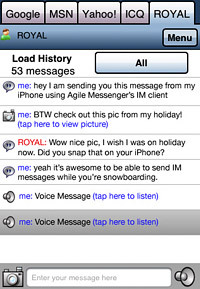 Being connected all the time means iPhone users love to instant message their friends on the go. Agile Messenger, which supports multiple IM protocols (such as AIM, MSN, etc. ), is a great way to keep in touch. Rather than download a bunch of individual instant messaging applications like Yahoo! Messenger or AIM, wouldn’t it be great if there was a way to combine all of your IM accounts in one easy to use app? That’s what the folks at Agile Mobile were thinking too. Their Agile Messenger iPhone application is available from the App Store for $9.99 and supports ICQ, MSN, AIM, Yahoo!, Jabber, and Google. They’ve also got versions of their software for Nokia and Windows Mobile phones, but we all know which platform ranks on top. I’ve been trying out Agile Messenger for a few days now and was pleasantly surprised by how many features are packed into this app. I’m admittedly an AIM guy for the most part, with occasional dashes of MSN and Yahoo! thrown in for good measure. Being able to handle all of these at once was a strong selling point. Upon launching Agile Messenger for the first time, I was greeted with a Select Services screen. This is where protocols can be turned on and activated with account login details. That’s really all there was to set up – it couldn’t be simpler. I won’t go through every nook and cranny of the program, but there are a few things worth highlighting. The user interface is visually appealing and easy to figure out. It’s the swift transitions between screens and menus which tie it all together, though, making it all feel very dynamic. I found Agile Messenger to be quite customizable as well. Contact lists and conversation windows can be altered with different font faces, text sizes, and graphic options. Portrait and landscape keyboard orientations are included as well. A really cool feature is picture and audio sharing. Users can record short audio messages or choose images saved on their iPhone to send over IM. The pictures are especially handy since iPhones won’t support MMS for another month or so. The ability to load a contact’s previous message history is pretty nifty too. I’m not sure how far back it can go, but it’s a great way to remember where a recent conversation left off. Even with all this great stuff thrown in, Agile Messenger (like most other apps) is still less than perfect. At the beginning it was somewhat buggy and unstable. After a few uses, however, they appeared to work themselves out and the app proved quite reliable. The only other downside – not being able to receive messages when the app isn’t in use – is an iPhone 2.0 software problem common to all IM apps. Apple’s forthcoming 3.0 update with push notifications should alleviate this annoyance, but Agile Mobile has a solution in the meantime. Users can sign up for a free gateway service which keeps them logged in for up to 12 hours and forwards missed incoming IMs to an email address. It’s a clever way of working around Apple’s temporary flaws and, as I mentioned, will probably be eliminated when push notifications arrive this summer. To enter, please leave a comment below, along with a valid email address (this is how we will contact you). In order to avoid spam filter issues, please type a coherent sentence saying you’d like a chance to win. Multiple entries will be deleted, so please only add one comment per person. And finally, don’t worry if your comment doesn’t appear on the site immediately — it might be awaiting moderation and will show up shortly. One more thing… this giveaway is only open to those in the United States. Sorry, international readers! The promo codes generated by iTunes are valid in the U.S. only. A winner will be chosen at random based on the comment number they happen to be. All entries must be made by June 10, 2009 at 11:59pm eastern U.S. time. In the meantime, cross your fingers for something cool from Apple at WWDC next week. Good luck! Congratulations to our winner Brad! His comment number was chosen from a random number generator and he has been given a free copy of Agile Messenger! Thanks to everyone who entered and remember to consider purchasing a copy of Agile Messenger to chat on your iPhone or iPod touch. This would be a great app to have. I’d love to enter! I’d like a free copy! I only use the free AIM on my iPhone now but this sounds way better. Me too. I’m on IM all the time and would love a free copy. I would love a chance to win a copy of this app. Thanks for the review, I think I’m sold! I’d love a shot at getting this app for free. I’d Love to have a chance to Win this Awesome New App from Agile Messenger! Cool, I want to enter! Wow… been waiting to compare this to the overhyped Beejive… Hope it holds it own against that giant… Fingers crossed!